G-LOC, or G-Induced Loss Of Consciousness, can occur when a pilot pulls such a tight turn that the blood drains from their head, making them pass out. In this recent de-classified footage, that’s exactly what happened to one pilot. Headed straight towards the ground at full afterburner, death seemed inevitable – until a new autopilot system pulled him out. 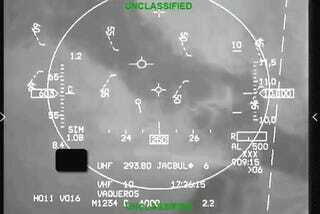 In the training flight video taken from the F-16's Heads Up Display, originally spotted by Aviation Week, you can hear the pilot’s labored breathing as he executes a sharp turn, experiencing more than eight times the weight of gravity upon his body. Around 21 seconds in, the sharp turn ends as the pilot loses consciousness, the fighter jet aimlessly drifting with its nose increasing pointed straight at the ground. The pilot fell down to just 4,370 feet before the plane began flying normally again, with the jet screaming nearly 13,000 feet towards the ground in less than 20 seconds. Sully 2 can be heard re-gaining consciousness as the instructor cancels the training scenario and tries to get everyone above 12,000 feet. The automatic recovery system, known as Auto-GCAS, or Automatic Ground Collision Avoidance System, which saved the pilot’s life was first put on F-16s in late 2014. If the system thinks the jet is headed towards the ground it automatically induces a 5G turn and rolls the plane upright. In this case, the system worked, and it saved the pilot’s life. Reminisce On That Time In The Early &apos;90s When F-16s Escorted MiG-29s Across The U.S.